Investors cheered a landmark deal on Monday that will see world powers relax economic sanctions against Iran in exchange for a promise that the country scales back its nuclear program. U.S. stock futures climbed 0.3%, tracking gains across world markets. Oil prices sank on the expectation of more oil exports from Iran following the nuclear deal. "Although there are several hurdles still to climb, including a skeptical U.S. Congress, the deal has already seen an initial impact in markets," said Simon Smith, chief economist at FxPro Financial Services in London. On Sunday, diplomats made history when Iran and six world powers reached an agreement over the country's nuclear program. The deal brokered between the U.S., U.K., France, Russia, China and Germany curtails Iran's ability to develop a nuclear weapon. Iran has been hard hit in recent years as various sanctions have hurt the oil-rich economy and led to staggering inflation levels. The gains for U.S. stock futures on Monday put the Dow Jones Industrial Average and the S&P 500 on course to continue their recent record breaking run. 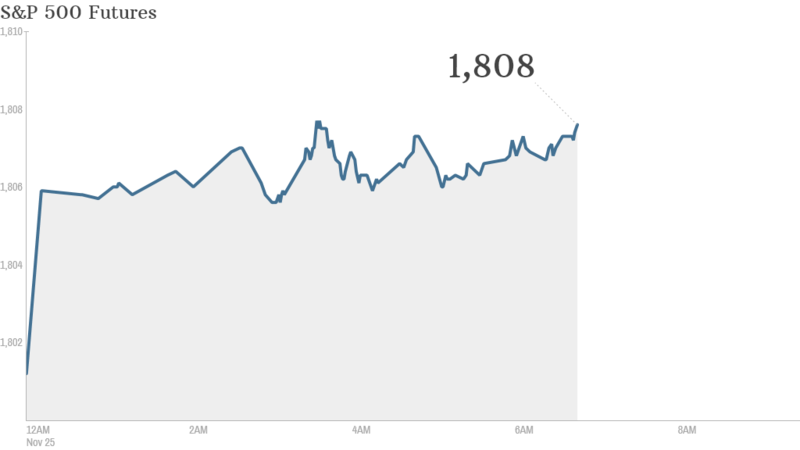 Last week, the Dow hit a record high and the S&P 500 closed above 1,800 for the first time. Trading volume is expected to be low during a holiday-shortened week. U.S. markets will be closed Thursday for Thanksgiving and will shut at 1 p.m. ET on Friday. In company news, Apple bought the Israeli company PrimeSense. Apple's (AAPL) stock slipped slightly in premarket trading. European markets were climbing higher in midday trading, with Germany's benchmark Dax index leading the way. Most Asian markets rose Monday, with Japan's Nikkei jumping 1.5% as the yen weakened against the dollar.